SLAP is an acronym that stands for Superior (topmost) Labral tear from Anterior (front) to Posterior (back) and refers to a torn piece of cartilage in the inner portion of the shoulder joint. The labrum surrounds the edge of the glenoid, which holds the humerus head, but the latter is usually larger than the glenoid socket. SLAP tear is associated with damage to the top of the labrum or where the biceps tendon connects to the labrum, which is a ring of cartilage around the shoulder socket that stabilizes the head of the upper arm bone. It can clinically present with pain and/or limited motion in the shoulder, especially overhead motions. It is caused by repetitive movements chronically or more acutely because of trauma or age. It is commonly seen in athletes engaging in repetitive throwing or overhead sports, but it is also possible in non-athletes. Type I: It is characterized by fraying of the top rim of the labrum, but it is still attached to the glenoid. It is most likely due to the aging process, and it is often asymptomatic. These tears are treated conservatively. Type II: It is the most common type of SLAP tear, and is characterized by labrum and biceps tendon being detached from the top of the glenoid. They can be anterior, posterior or both. It requires arthroscopic surgical repair. Type III: It is a bucket-handle tear, where the torn labrum could droop into the shoulder joint, but the biceps tendon remains intact. It also requires arthroscopic surgical repair. Type IV: It is a bucket-handle tear to the top of the labrum, extending into the biceps tendon to varying degrees. Treatment options could depend on the extent the biceps tendon injury. It primarily causes limited motion in the shoulder joint, the extent of which depends on the type of SLAP tear. 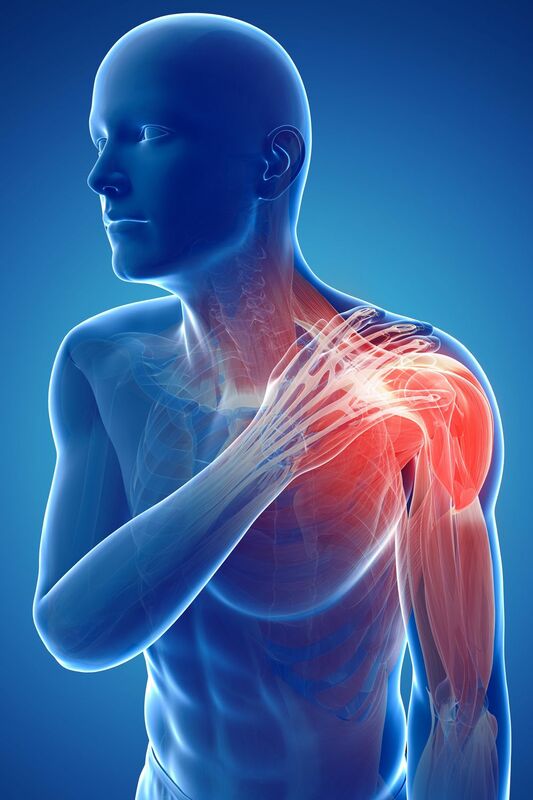 Certain shoulder activities, such as lifting objects overhead, throwing a baseball or hitting a tennis ball are especially affected and may cause pain. Extending the arm to lift an object, stretching the arm behind the head or placing the arm in a throwing position can also be limited. The pain is typically deep, aching shoulder and is commonly felt at the back of the shoulder; but if the SLAP tear includes the biceps tendon, pain may be felt at the front of the shoulder. These patients may also complain of popping, clicking, grinding or locking sensations in the shoulder. There is a feeling of unsteadiness, as though the shoulder will “pop out” of its socket. The diagnosis can be made on MRI but arthroscopic surgery confirms the diagnosis. Nonsurgical (conservative) techniques are tried first for types I and II and include stopping the movement/activity that precipitated the injury in the first place. Anti-inflammatory agents such as ibuprofen may be taken to decrease swelling and pain. Physical therapy exercises can be helpful and are typically done for three to six months. Arthroscopic surgery is the most common surgical technique and is diagnostic as well as therapeutic when coupled with repair. But there is a new alternative – stem cell therapy. Regenexx stem cell therapy can treat the shoulder pain and restore joint damage non-invasively. It entails none of the complications of surgery and the downtime and recovery are much shorter with no need of rehab.